“Monday afternoon after reading the announcement of the Coleman skatepark session this upcoming Saturday, I decided to check out the park for myself. I didn’t have much expectations for the park based on it’s old layout and how quickly the new park was built, but I was surprisingly shocked with how well the outcome of the park was. Sifting through the many kids that filled the park, I started taking mental images of the spots that I would love to take pictures of during future visits when not a lot of people were in attendance. While skating, I saw that two NYC veterans were in the park as well. Phillip Suarez and Felix Guzman. I started filming, getting a few clips of both skaters on the main box in the middle of the park. I then saw Felix debating on hitting the ramp to rail on top of the fence. His first attempt was very close so I knew he’d be able to do it within a couple of tries. I filmed him lacing a top acid and fishbrain on the rail, but felt like the fisheye I was using to film really didn’t do the tricks justice. The height from the ramp to the top of the rail is pretty high and the angle of the ramp is really steep, so you definitely need some hops to make it atop. After picturing how I wanted to present Felix’s trick, I asked him if he’d like to do it again for a photo. After a few approaches to the fence with many kids getting in Felix’s way, Phillip took on the role of temporary bouncer to give Felix a clear runway to hit the rail. I hopped over the ledge, leaving the park, and positioned myself on the fence of the baseball field next to the park. I wanted to shoot it from this angle to truly show the height of the rail and show the distance from the ramp to the rail, which is about where the concrete ends and the fence begins seen in the photo. I felt like this angle would do Felix’s trick justice and was happy with how the photo came out when Felix laced. I hopped back over the ledge and kept skating on into the night with Phillip, Felix, and many others that joined in. Hope to see you guys there this Saturday for the session!” – Craig Benabu. 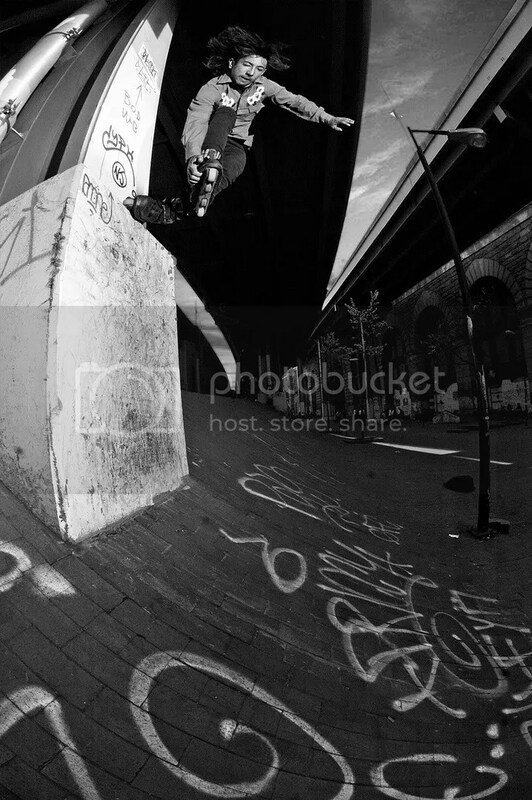 “The Brooklyn Banks in New York is one of the most famous spots in the world of extreme sports. Already in the mid 90’s the first generation jumped the stairs and worked on their first grinds. Over the years the spot, which is in front of a huge police station, became a legal street spot and some of the biggest real street events in blading, skateboarding and BMX took place at the banks. But today the spot is un-skatable since its giving construction crews a staging area for trucks and equipment until 2014 during a four-year renovation of the Brooklyn Bridge. 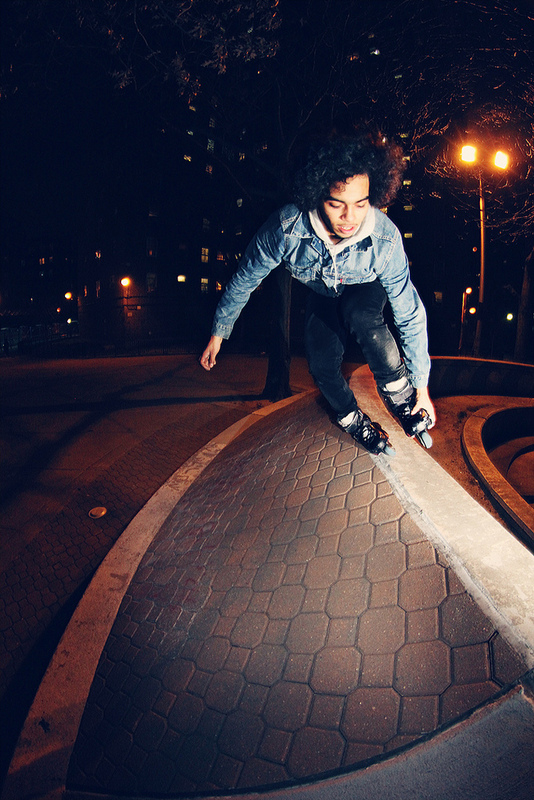 We spoke to some of the NY locals to find out how they feel about the situation…” – Blading.info.” Full articles at Blading.info. 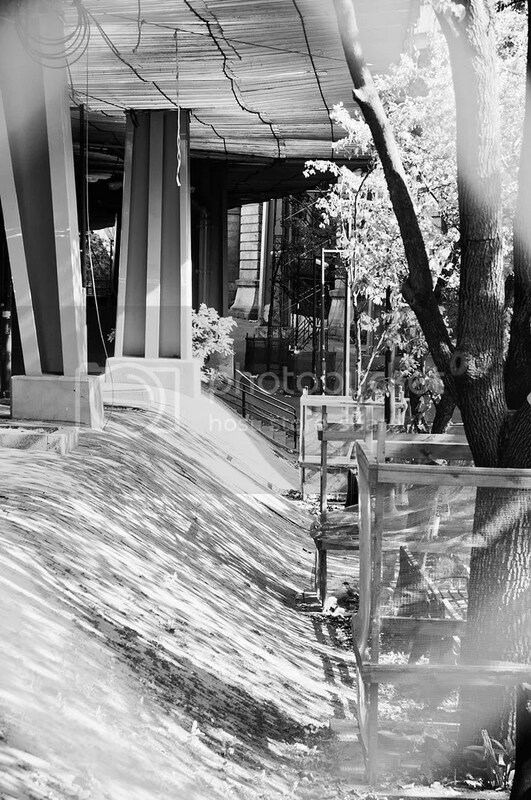 Austin Paz about the Brooklyn Banks What does this spot mean to you? This is one of the few spots I’ve seen people skating since before i started in the mid-90s. Every time I see or think of the banks, I see history. The Brooklyn Banks is the Madison Square Garden of skating. If you go to MSG, all over the place you can see huge pictures, portraits, and plaques of historical moments in sports that have happened in that arena throughout its existence, I always felt you could do the same thing at the banks. Here’s Angelo Ferrer (The Art of Rolling) about the Brooklyn Banks. Best memories from the Banks? One of my personal favorite moments at the Brooklyn Banks occurred when I was young and there was a huge NISS skate competition at south street seaport. I was very young at the time and was lucky to be unsupervised by my parent and joined the mob of skaters that flocked the Brooklyn Banks. I remember at the time there being skaters from all over the world there. It was my grommet period in skating and I adored how all the pros I looked up to happen to be in one spot at the same time. For whatever reason the Brooklyn banks session stood out more to me than the competition that took place shortly before because everyone was putting in so much energy. It was great to see what normally I would only see on television take place right before my eyes. I think so. Provided the rugged layout, dirty unforgiving floors and raw obstacles in a place where it was easy to meet bladers from all over the five boroughs I think it embodied NY blading in a nutshell and it shaped my blading in terms of working with what the spot has, making old things into something new, creativity etc. The Brooklyn Banks definitely had an influence on my development as a rollerblader and I think it influenced almost everyone that was lucky enough to skate it. The Banks was one of the premiere spots in New York City to try out new tricks and perfect the ones you already had in your vocabulary. 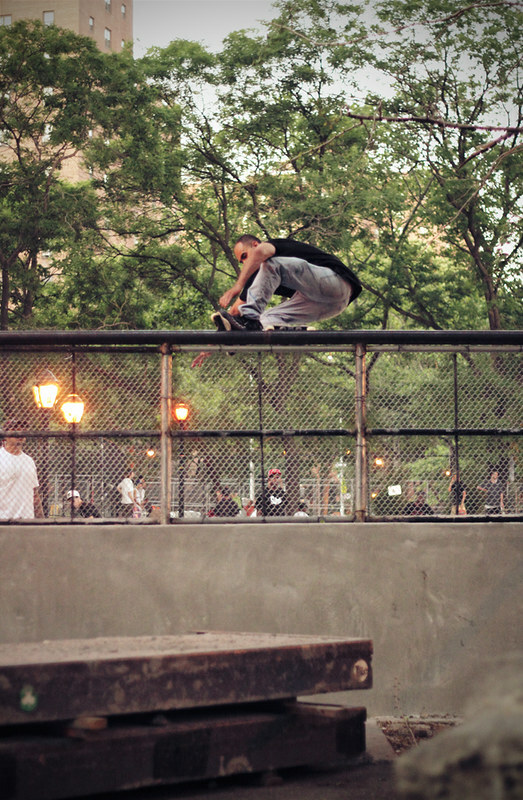 Not to mention it was the spot where all of the big tricks went down during most of NYC’s biggest competitions. The down rail was the perfect setup to get people juiced to try new tricks and when the bigger stair rails were put in, it was time to step it up and see what you could really do. The Brooklyn Banks was about 4-5 different spots all in one location and I think it helped a lot of bladers with their tricks and influenced them to try new ones. Read the full interview on ShutUpAndSk8. “Craig Benabu’s 5W’s is a great read and I hope that it lights a fire under NYC’s collective asses. I sent over my questions and he provided me with thorough answers making this my favorite 5W’s thus far. Thank you Craig for being honest and telling it like it is” – SUAS. With all of the new amazing talent that is brewing in every borough WHO do you see as the young leaders of the future of NYC blading? No doubt there is a ton of talent in NYC, but as for leaders? Unfortunately, I really don’t see anyone stepping up to the plate and trying to do something more for our scene than just trying to make a name for themselves and the small group of friends they skate with. A leader to me is someone who is trying to expose our local scene and talent as a whole. A leader is someone who shows love to everyone, not just a select few. Our scene lacks unity. There was a short period of time where most, if not all, of the rollerblading media heads were working together or at least working under the same umbrella, and honestly that was when NYC was blowing up again within the blade media. I’d say this was around 2009 up until late 2010, where most decided that they would be better off on their own focusing on stamping their name on everything and only working within their own website or crew. Now look where NYC is at. There’s no coverage on our scene on any non local blade media site, or in any magazines or videos, and the people that branched out are barely putting out any new media. We’re back to being one of the biggest but least exposed scenes within this small community and honestly it’s our fault. Everyone’s too concerned with just building their name up instead of building up NYC as a whole. After all these years HOW do you keep up with providing new content daily to I ROLL NY? Well this year I’ve made some changes. I stopped mindlessly posting content and media from anyone and everyone. After about five years of showing love to just about anyone, I started to ask myself who were the people that were showing love back? Who were the people that I helped come up in this industry that still continue to help the site out? And unfortunately the list was and still is very small. With mostly everyone only looking out for themselves these days, I decided that it’s not fair to our scene as a whole to share content from people who’s only focus was to build their name up. As I said before, I recently updated my equipment so now I have the chance to create content that brings the site’s focus back on the NYC scene as a whole myself. Full Interview. Filmed and Edited by Craig Benabu. Youtube link after the jump. “I met up with Jordan Thursday December 29th at the box on 12th Street and Avenue D located in the Lower East Side of Manhattan. We started filming for an upcoming edit and moved from the box to the bank ledge. There wasn’t a lot of lighting in the area making it difficult to film so we decided to try get some photos instead. After a few test shots, and discussing how we both wanted the photo to look, I was able to catch Jordan lacing this fishbrain stall. After both approving of the photo we moved on and kept filming at the next location” – Craig Benabu. “James Perez has been on a skating hiatus due to his recent pursuit of a college education and currently working a full time job. Luckily, I was able to meet up with James during his only day off last week for a brief session at the Pier 25 skate plaza located in Manhattan, NY. James dusted off the cobwebs from his blades and quickly got back into the skating rhythm as we managed to beat the the rain, clouds, and park closing” – Jasepi Calamari.